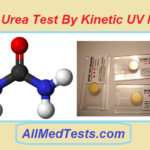 We have already talked about the Kinetic UV Method in which we determined Urea in Serum. Today we are going to use the same test for the determination of SGOT. SGOT stands for Serum Glutamate Oxaloacetate Transaminase. This is an enzyme from the transferase class. This enzyme is responsible for many activities including heart, liver, and kidneys. This enzyme can be used in many operations due to its fast reactivity. It is also very vital in hepatitis and necrosis so that’s why need to determine it. For the determination of SGOT, one of the good tests we can do is Kinetic UV Method. 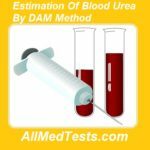 If you have read our previous article in which we estimated urea in serum with this method then you don’t need to work hard in this once since serum SGOT test is same and only a few elements will be changed for determining SGOT. Principle and Reagents for Determination of SGOT by Kinetic UV Method. Since we already know what is Kinetic UV method, let us now move on to the study of principle and reagents involving in this test. First, we will talk few things about the principle and then we shall move on to the reagents. SGOT catalyzes the transfer of an amino group from L-Aspartate to α-ketoglutarate. The rate of reaction is monitored using a coupling enzyme MDH, whereby the Oxaloacetate formed is converted to Malate in the presence of NADH. The oxidation of NADH is measured by monitoring the decrease in absorbance at 340 nm. 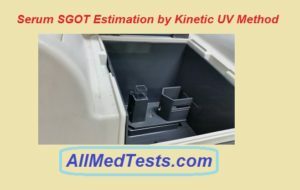 So, this is the simple principle AST Test by Kinetic UV method. Once you have understood the principle, there will be no trouble in performing this test. After understanding the principle, we shall move on to study the reagent that we are going to use in this test. The reagents that we are going to use in this test are TRIS buffer, L-Aspertic, LDH, MDH, a-ketoglutarate, and NADH. The concentrations will be 100 mmol/L, 300 mmol/L, > 2000 UI/L, > 600 UI/L, 60 mmol/l, and 0.36 mmol/l respectively. Alongside these reagents, we are also going to use few specimens. These include unhemolysed Serum and EDTA Plasma. Also, blood samples are used in the test and the ones collected in the morning are preferred. All these reagents remain stable at a temperature of 2-8 degrees. Let us now move to the procedure of performing this test. 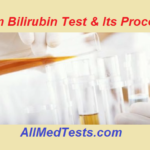 Here is a list of all the steps involved in the procedure of performing this test. Make sure that you follow each and every step carefully and you will be done within a matter of seconds. Let us perform the determination of SGOT by Kinetic UV Method now. 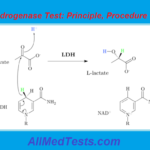 In the first step, make sure that you warm the reagent before performing the test. The temperature should be 37 degrees and it should be before use. 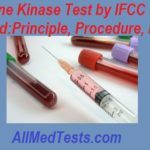 Now you will pipette enzyme reagent 1.0 and serum/plasma 0.1 into the test tubes. Now mix these reagents and make sure that you immediately send this into a thermostated cuvette. Ao must be examined after 1 minutes and then A1, A2, and A3 after 1 and ½ minute. Then you will need to some calculations using the following formulas. Calculate the average change in absorbance per minute (A/ min) Activity of SGOT in IU/L. So this was a complete principle, reagent, and method for serum SGOT Test by Kinetic UV Method. If you have any queries about the test then leave them in the comment section along with your precious feedback. 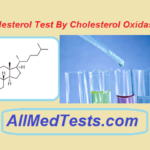 Keep visiting our website for free biology tests.